James Spencer holds a B.S. degree in Environmental Geology and an M.S. degree in Geology from the University of Mississippi. 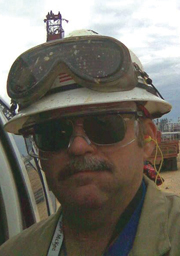 He has 28 years of technical services in the geosciences, including six years with the Mississippi Department of Environmental Quality, as well as 22 years with private environmental consulting firms—most recently as Senior Geologist with Cook Coggin Engineers, Inc. where he also manages the Material Testing Laboratory. Accredited as a Professional Geologist in three states (Mississippi, Tennessee, and Arkansas), Mr. Spencer holds membership in the Association of Environmental and Engineering Geologists and the National Ground Water Association. His publications and professional presentations include submissions to the U.S. Geological Survey, the U.S. Environmental Protection Agency, the National Ground Water Association, the International Conference on Remediation of Chlorinated and Recalcitrant Compounds, the American Institute of Hydrology, and Remediation Journal. Mr. Spencer and his family attend the West Main Church of Christ in Tupelo, Mississippi where he serves as a deacon and teacher.